One for sure is my wife, Barbara Elaine Astles, nee Evans of 6 Cross Lane. She is on the far left hand side, FULL picture. Thanks Cliff. I wonder if she remembers the occasion? It's been pointed out that this is possibly not a Mayday picture at all, but a photo of a religious (possibly Easter?) procession - Ed. 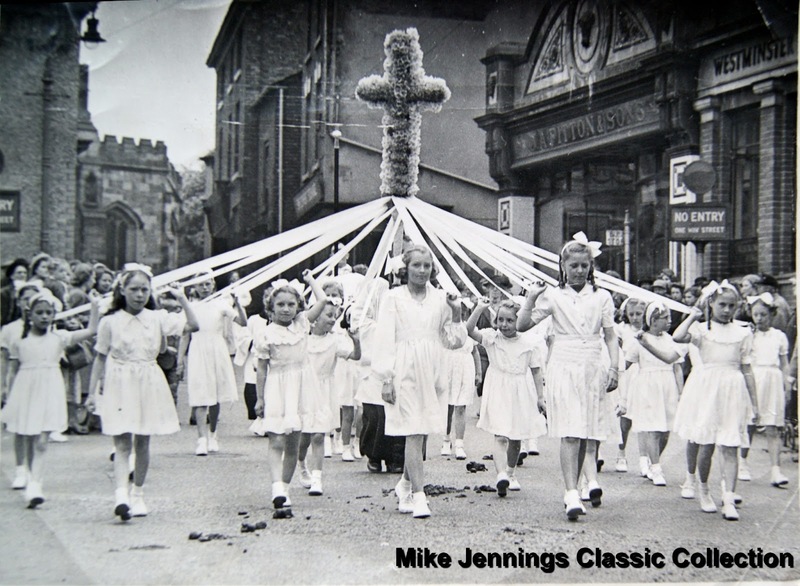 Barbara says " It was a St Michaels Church Event and was done each Whit Sunday. They would walk from the Church along Wheelock Street, stopping a number of times to carry out a Maypole Dance of winding in and then out of the ribbons". She cannot remember if they then went back to the church, but there were always crowds of people watching the procession as they went along Wheelock Street. Many thanks for that, Cliff (and Barbara). I'll incorporate this info into the text.